Basically, a splitter is a passive device which accepts an input signal and delivers multiple output signals with specific output phase and amplitude characteristics. 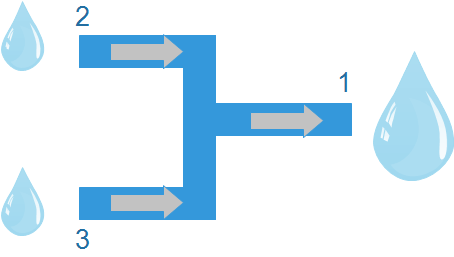 In the following figure, we see a simple illustration of a Splitter. The signal (represented by large drop of water) goes in one side and out the other two (2) and (3). Note that the output signal is the same (has the same form), but each output has ‘half’ the power of the original signal. The same happens when we feed RF signal at one port, and gets the RF output from other output ports. And the reduction in the output signal level depends upon the number of outputs for which the signal is splitted. For example, if at the input of a 4 output divider we have a signal of +30 dBm, there will be a signal of +24 dBm in each one of its outputs. If we reverse the use of equipment shown at the beginning of the tutorial, inputting 2 different signals on ports (2) and (3), we have the sum, or ‘combination’ of these signs on the output (1). You’ve probably noticed that, actually, the combiner is nothing more than a splitter, but used in the reverse way, right? And that’s exactly what it is: a RF Power Combiner simply combines (sum) different signals in a single output. 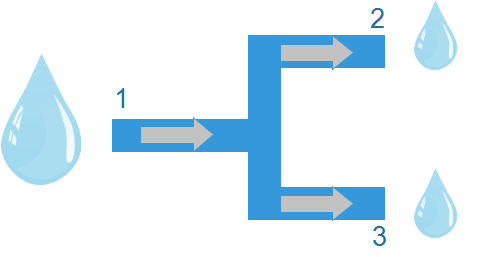 In the above case, the signals are transmitted over port 2 and 3, go out through that output (1). And also it is easy to understand that all the features as Loss and Isolation of RF Power Combiner are the same we have previously seen for the splitter. As the splitter, the combiner is also a passive element. One can use a same device either as splitter or combiner depending upon the application, but following key parameters needs to be checked before.